2019's GIAS (Global Investment in Aviation Summit) is certain to attract over 500 industry leaders. The UAE is the central hub for air freight and passengers in the Middle East & North Africa, with continued strong investment to ensure demands are met. Airlines worldwide will add 11,671 aircraft and grow to 37,978 in fleet size in ten years by 2028, from the current fleet size of 26,307. Dubai will host the first Global Investment in Aviation Summit (GIAS) – a major aviation conference – to be attended by the world’s 500 top aviation finance, aviation asset managers, aircraft lessors, investors, airlines, aircraft manufacturers, maintenance, repair and overhaul (MRO) facilities, aviation logistics suppliers, fixed-base operators (FBOs), as the UAE emerges as the region’s biggest aviation hubs. The high-profile delegates from 40 countries will include 20 Aviation Ambassadors, 10 Knowledge Partners, 200 Aviation Officials and 300 Investors brainstorming throughout the three days. The three-day aviation investment conference will take place as the UAE authorities are investing Dh85 billion ($23.16 billion) in airport development and expansion that will see its airports handle develop combined capacity to handle more than 300 million passengers per year. These include Dh30 billion ($8 billion) in developing Al Maktoum International Airport, Dh28 billion ($7.6 billion) expansion of the Phase IV of Dubai International Airport, Dh25 billion ($6.8 billion) re-development and expansion of Abu Dhabi International Airport – many of which are supported by the banks and financial institutions. In addition Sharjah International Airport is also undergoing a Dh1.5 billion investment in expansion of its terminal. The UAE has 14 airports, air strips and airfields served by 113 airlines with a total annual take-off and landings exceeding 540,000. In addition to these, the four UAE airlines are also investing billions of dollars in acquiring the latest aircraft models that will help the UAE economy to grow. All these developments need funding and the financial institutions and investors are also expanding their capabilities to support the economic growth. “I am delighted to be here today as we prepare for the Global Investment in Aviation Summit. This summit is very close to UAE’s heart, as we have much to be proud of as a nation, from our humble aviation beginnings to now one of the biggest passenger hubs in the world,” HE Mr Saif Mohammed Al Suwaidi, Director-General of the UAE General Civil Aviation Authority (GCAA), said. “Our airlines and airports have been ranking consistently as among the best internationally. On compliance level, UAE ranked as a top member state of the International Civil Aviation Organisation. “The Global Investment in Aviation Summit is UAE’s testament on how far we have achieved and of our commitment to push the nation to be a global pioneer in this field. The glass ceiling is not too high to break as we have mounted unimaginable innovations. The three-day international summit of the aviation leaders will be held from January 27-29, 2019. The summit is held at a time when the region’s aviation industry rides high on efficiency and performance. Emirates Group posted a profit of Dh4.1 billion (US$1.1 billion) for the financial year ended 31 March 2018, up 67 percent from the previous year. The combined fleet size of the four UAE airlines reached 502, including Emirates fleet of 268, Etihad Airways’ 120, FlyDubai’s 61 and Air Arabia’s 53. The UAE airlines add between 4-5 aircraft per month and the total combined fleet size of the UAE’s four airlines would cross 525 by the end of 2018. The UAE airlines have more than 300 more aircraft on order to join their fleets. “The UAE is the largest airline market and aviation hub in the Middle East and North Africa and it is still the most vibrant market where the airlines are adding new aircraft every month to their fleet,” Saif Mohammed Al Suwaidi said. “Not only as the country hosting the largest combined aircraft fleet, the UAE has also joined the global aircraft manufacturing supply chain management with Strata manufacturing aircraft components for both Boeing and Airbus. “Dubai South – the largest aviation hub – is also developing aviation, airline and aviation-related industries and institutions, that will help the region develop new technical and research capabilities that will help the global aviation industry. He said, “the Summit will also offer the local market, from within the aviation industry and its related sectors, a great opportunity to expand their business operations from fresh investments generated from the summit. GIAS 2019 will be a specialized and focused gathering where the local market can network with investors to present their ideas and projects”. “Likewise, these benefits and opportunities will be enjoyed by the international market who will attend the summit. 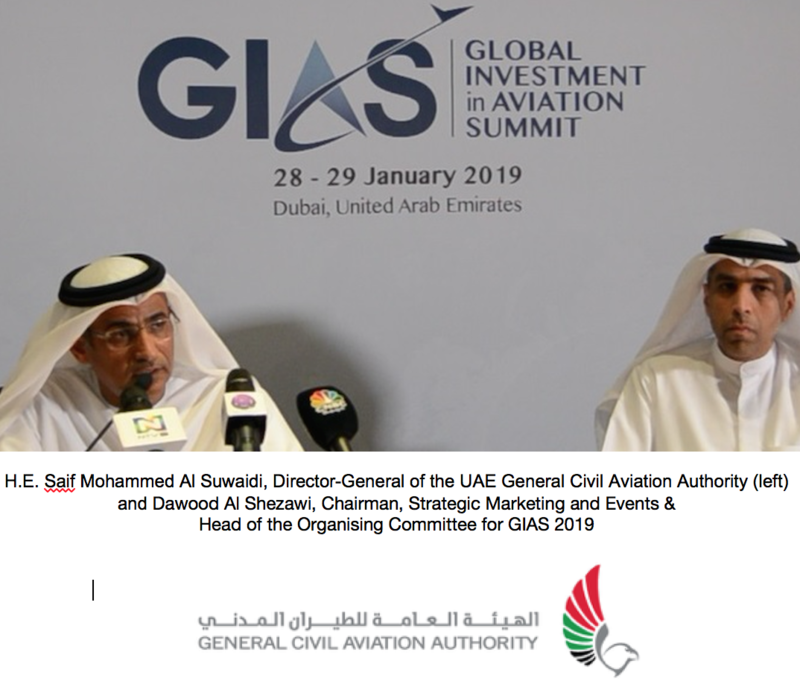 Local and international investors who are keen to establish investment partnerships and collaborations with another investor or with an organisation, city, or country for their aviation projects, can maximize the platform being offered by GIAS 2019,” he said. Dubai Airshow – the region’s largest aviation industry exhibition – last year saw $114 billion worth of orders signed, including $27 billion worth of orders by FlyDubai for 225 Boeing 737 Max aircraft and Emirates Airline’s $15.1 billion for 40 Boeing B787-10. Dubai South, the world’s largest Aerotropolis hosting Al Maktoum International Airport – the world’s largest greenfield airport development – is undergoing a massive development programme with investment to the tune of Dh110 billion (US$30 billion) – which will be the future home of Emirates Airline – the world’s largest international airline. Aviation Industry is one of the most important economic sectors globally, the demand for air transport will increase by an average of 4.3 percent per annum over the next 20 years. This implies that demand for air travel will increase by a factor of two and a half over the period. Airlines worldwide will add 11,671 aircraft and grow to 37,978 in fleet size in ten years by 2028, from the current fleet size of 26,307, according to PlaneStats – an aviation research platform by global aviation research firm Oliver Wyman. “The global fleet is forecast to grow 4.2 percent annually over the first five years, then slow to 3.3 percent in the second five years as the rate of deliveries decreases and removals remain high. These dynamics will result in a fleet that is younger and larger in average seating capacity,” The report Global Fleet & MRO Market Forcast 2018 – 2028, by Oliver Wyman said. The Global Investment in Aviation Summit (GIAS) will feature International governments investment proposals delivered by key government ofﬁcials and private sector top executives, and will provide attending ﬁnanciers with a fact and ﬁgure checked perspective on ongoing and future projects. The meeting will offer a reliable environment to build conclusive partnerships and solid bonds between investors and projects developers, to make strategic and informed investments in the several represented at GIAS 2019. The three-day eventful summit will see a number of hectic activities, including the GIAS Summit, GIAS Masterclass, GIAS Aviation Investment Destination, GIAS Investor Lounge, GIAS New Business Accelerator, GIAS Ambassadors, GIAS Bilateral Meetings, GIAS Aviation Super Stars Closing Ceremony, among others. GIAS Summit: This two-day event will focus on presenting the most attractive sectors in aviation for investments, it’s future outlooks, factors that will drive regions development, public and private ventures, as well as government incentives to key projects in aviation. With careful selected key speakers and led panels participants will get exclusive and curated content with enormous relevance for their ﬁnancial interests. GIAS Masterclass: At the ﬁrst day of the events, world experts, and reference projects, will gather to offer participants a 360 degree view on the best investment practices with interactive masterclass outlined for institutional investors and project ﬁnance managers looking to understand aviation ﬁnance and airport project ﬁnance. Global Investment in Aviation Summit (GIAS) is an international aviation investment conference held every year in Dubai that focusses on a major economic area – aviation, air transport and air logistics sectors – some of the major contributors of the UAE economy. The three-day event, organised by Strategic Marketing and Exhibitions under the patronage of the UAE General Civil Aviation Authority (GCAA), will host more than 500 delegates, businessmen, investors and aviation officials from the region’s airlines and aviation organisations.